Swimming pool foam can be a huge distraction in and outside of your pool. Foam, or bubbles, make the water feel sticky and can make swimming uncomfortable for some. Good news for the kids, though, a foamy pool is safe to swim in. Still, we always recommend getting rid of the foam as soon as possible. But, how did it get there in the first place? This blog dives into what causes pool water to foam and explains how pool owners can prevent foam from forming. If you’re reading this blog that means you’re asking yourself the same question, “Why does my swimming pool have foam?” Foam in pool water actually forms from a number of reasons. So, we won’t be able to pinpoint your exact cause without running through the list. Question One: Have you added any chemicals to your pool recently? If you answered yes– what kind of chemicals did you add? On occasion, pools can foam after pool owners add algaecide to their water. Whenever pool owners are searching for an algaecide, we always recommend purchasing a good one ($$). And yes, sometimes that means skipping over Walmart. Make sure you check the bottle of algaecide, as well. 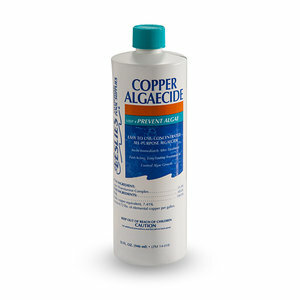 Stay away from algaecides that contain copper or any unnecessary metallic. Cheap or algaecides containing metals can cause your pool to foam and you should avoid them. In addition to watching the type of algaecide you’re using in your pool, also pay attention to the amount you’re using. If you overuse algaecide, it can cause foaming. We always recommend following the suggested dosages listed on the bottle. Lastly, pay close attention to the chemicals typically sold in spring opening kits. If you add a pool opening kit to a well-maintained pool, it can cause your pool to foam. This happens because there are no algae in your pool to destroy. Springtime algaecides use surfactants to work and these molecules react with agitation causing froth. ** If the foam in your pool is caused by the type of algaecide you used, it should break down on its own. To speed the process up, you can skim the foam off the surface of your pool. Question Two: Have you balanced your pool recently? An imbalanced pool can be the culprit to a lot of maintenance issues and foaming isn’t an exception. The first step to maintaining a clear pool is balancing the water. We recommend you to test your pool water and pay attention to your calcium hardness levels. Have you heard the term “soft water”? If someone says their pool water is soft that means it has low calcium hardness. Soft water is highly susceptible to foam. Question Three: Have you had swimmers in your pool recently? Have you ever read that rule that swimmers should rinse off before getting into pools? How many of us actually remember to do this? Odds are, not many. The main reason we recommend rinsing yourself off before jumping into the pool is to remove any makeup, oils, shampoos, or other detergents. These contaminants mix with the chemicals present in your water to produce foam. I know this rule can be tough, especially for little ones. However, by remembering to rinse off before jumping into the pool, you can prevent foaming. If you’re experiencing foam or bubbles in your swimming pool and none of these questions help pinpoint the root- give us a call. We’d love to help determine why your pool is foaming. How much would cost to get someone to give pool maintenance?.